I make quite extensive use of "Put Away Leftovers" which was introduced with the Seasons EP. 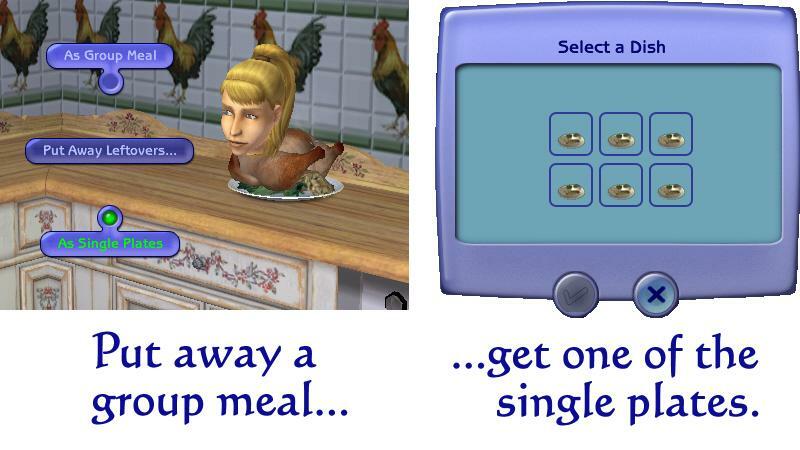 However, I do find myself having to micro-manage my Sims' actions when they "Get Leftovers" since most of my leftovers are in the form of group plates and so food is left out on the side which if not put away again will spoil, thus defeating the object of leftovers. The "Get Leftovers" side of things is made much easier if leftovers are put away as single dishes, but that's also a lot of micro-management at the "Put Away Leftovers" side of things. Wouldn't it be easier if "Put Away Leftovers" of group plates actually put it away as lots of single plates, but with only one direction and without all the to-ing and fro-ing from counter/table to fridge? If you recognise this problem as something you also do, then this package is for you. This package changes the behaviour of "Put Away Leftovers" when used on a group plate. There are two modes now for group plates as shown below. Once put away the leftovers are stored in the way you chose. You cannot change single plates back into a group plate again. In other words the decision is made at "Put Away" time. This operates exactly as before, putting the group meal into the fridge as a group meal. This is the new functionality, this allows you to put away a group meal as the correct number of single plate portions instead. Leftovers were introduced in Seasons EP. This is why this mod is marked as requiring Seasons. However, the leftovers function was rolled into later EPs after Seasons, so the real EP requirement is Seasons or later. You will know yourself whether you have leftovers capabilities. If you do, you can use this mod, if you don't, you can't. This mod works with the Autonomous Put Away Leftovers mod. 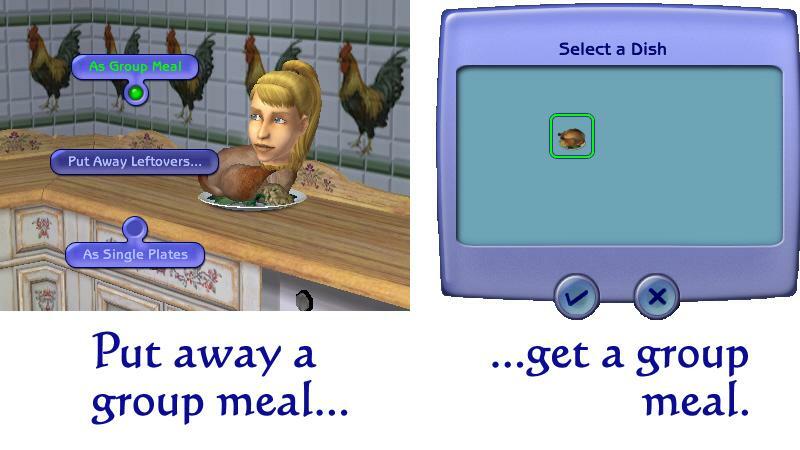 Clearly you cannot autonomously use both the options above, so although both are available on the menu, we have to choose one to be the autonomous action. The current version of this mod chooses the single plates action to be the autonomous one (as I believe you wouldn't bother with this mod if you were happy with putting away group meals as group meals). If anyone wants the alternate behaviour, please post a comment and I will upload an alternate package that has the group meals version as the autonomous action. This mod clashes with AncientHighway's Autonomous Put Away Leftovers. Please use the this mod or the equivalent mod by BoilingOil which can be found here instead. I don't know of any other mods that this mod clashes with, but there is always the possibility. The pertinent information for the owner of the other object is here. Fixed a jump bug in the pie-menu creation that stopped this mod working for users with Seasons, but no EP beyond Seasons. Made put away as single plates the autonomous action now that we have a non-clashing Autonomous Put Away Leftovers mod. All the people responding on the Creator Feedback Forum who helped me in designing this mod. Kimberlyrice_a_roni for providing details on the Seasons only jump bug.